Embarrassing / Hilarious fan footage of Jordan Pickford emerges – A must watch for NUFC, Everton & Sunderland fans – NUFC blog – Newcastle United blog – NUFC Fixtures, News and Forum. 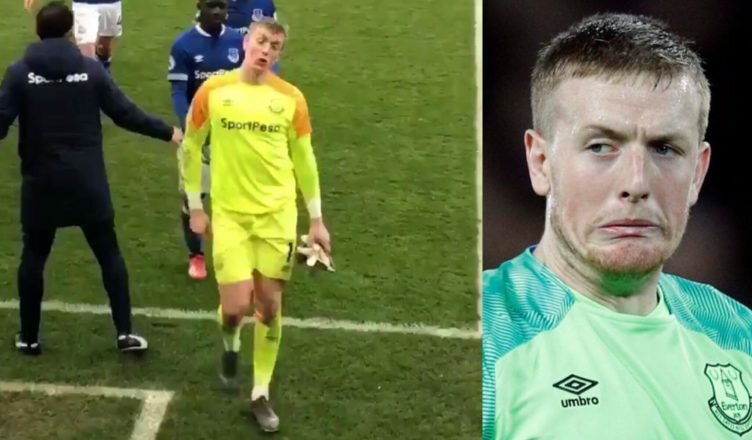 If scoring three past him and seeing him make mistake after mistake wasn’t enough, footage has emerged of Jordan Pickford making a fool of himself as he left the field at St James’ Park on Saturday. @JPickford1 strutting off the pitch (after gifting us 3pts) and offering NUFC fans out as he heads down the tunnel.. He should’ve been sent off in the first half, but it’s a good job he wasn’t given he gifted us two of our three late goals, showing no composure and zero class as Everton completely crumbled under the pressure. Forgetting the fact he’s a bit of a twerp and a Mackem and just focusing on his footballing ability for a second, I honestly don’t get the hype with him. He shouts a lot and kicks a ball far, but there’s nothing else he does well on a consistent basis based on everything I’ve seen over the past year. Erratic, awful jumpy footwork and impulsive when he needs to be calm (both with the ball & when coming out). He’s now made more errors leading to shots and goals than any other Premier League player this season. Not only should he have been sent off yesterday (thank god he wasn’t! ), he made at least 6 mistakes – whether it be poor handling, poor reflexes or poor judgement – and even his distribution was like a kid at play time who knows the bell is about to go. A win over any side when you’re 0-2 down is sweet enough, but this video of a rattled Jordan Pickford is the icing on the cake. Hes just a mackem….what else do you expect.